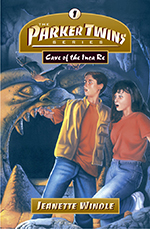 While traveling with their uncle to Bolivia, Justin and Jenny Parker get tangled up with smugglers and their only escape is the Cave of the Inca Re. Is the power of God greater than an ancient Inca curse? 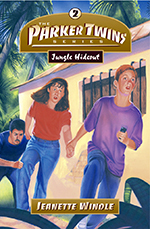 Justin and Jenny aren’t in the jungle long before they realize that the scorpions, tarantulas, and jaguars are the least of their concerns. It’s the violent drug traffickers that really have them worried. Does prayer really make a difference? 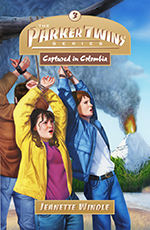 When Uncle Pete is kidnapped by Colombian guerrillas, the twins must find him before a nearby volcano erupts. But that means deciding whether to trust a new friend—and to forgive. 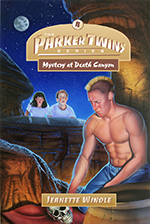 Visiting a Montana Indian reservation, the twins see what appears to be the ghost of Chief Thunderbird. When they investigate, they find chilling answers and life-threatening danger. In a face-off with an angry shaman, can the reservation’s fledgling church—and the twin’s own faith—stand the test. 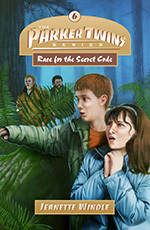 When a gang terrorizes a Vietnamese friend’s neighborhood, the twins join forces with him to expose the gang. 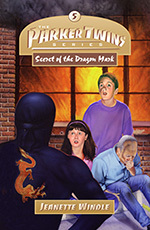 As they become targets of those with the dragon mark, they discover that standing up for faith and friendship can mean stepping over the line of their own personal safety. Mr. Parker is accused of selling defense information to terrorists. As the twins scramble frantically to prove their father’s innocence, they must answer the question: Do even the best of motives justify telling a lie?